Today is the birthday of the Baby Faced Assassin, and Under Armour hooks him up with his very own PE of his first signature model, the Curry 1 for his game tonight against the New York Knicks. 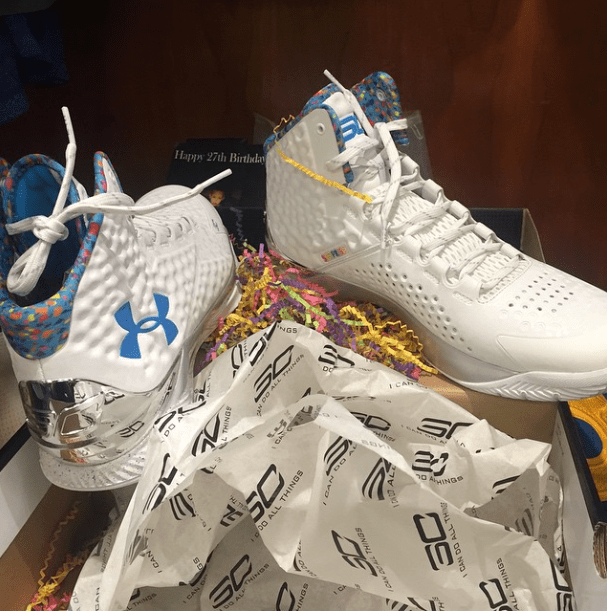 This colorway of the Curry 1 makes use of an all white upper (maybe glow in the dark? ), silver midsole, and metallic silver heel cup. A confetti inspired inner lining gives of a fruity pebbles feel, and the blue Under Armour logo pops off the white upper very nicely. Overall, this colorway of the Curry 1 looks like it wont hit shelves, but the question is; would you cop? Let us know in the comments section below, and stay tuned to WearTesters.com for any upcoming information on the Curry 1 and all of your performance needs. Not feeling the inner lining at all. The rest is dope. these are clean and I likes the Chrome heel, just like the Year of the Goat Clutch Fit Gold heal is sickly. Only Prob that I feel with design touches like these is that you cant see what is going on. When you watch an NBA game either at the Game or on TV you can never see the subtle touches like a Fruity pebble inner liner, MAYBE the chrome heel counter will come across on TV. I might have “93 til’ ” on Loop but simple heavy color blocking is always DOPE. Floral Prints and small hits of color here and there work well at a BBQ when everyone is within 7 feet from you or your hanging around with your feet up at a coffee table you can surely Stunt but for an NBA player to rock such small details – they looked just Standard White from my Plasma. this shoe looks awesome! I hope they do put the shoe on sale I would definitely buy it. I bought the Curry 1 Dark matter, feels and performs great. I’ve been loyal to Nike all these years but I think Under Armour is going to earn my business. I really love this colorway, I want a pair of this! A MUST-COP! I really wish these would drop because I love how they look and the insole is really cool as well. Plus the Curry One performs great and is super comfortable. I love the chrome heel cup as well. If these released alongside the BHM and Chinese New Year Curry One’s I would definitely cop them all. Last year’s were beautiful, and this year’s are no different. That Anafoam actually looks good on this park unlike the other CWs. These look AWESOME in the dark. I guarantee they do not glow the way you think they do. I’m sure nightwing or someone at weartesters will post the pics, but if you wanna check it out, nice kicks has the pics. Only colour way I would buy!